Background: Paraquat (PQ) poisoning is a serious public health problem in many countries. In spite of different treatments, the mortality is still high. 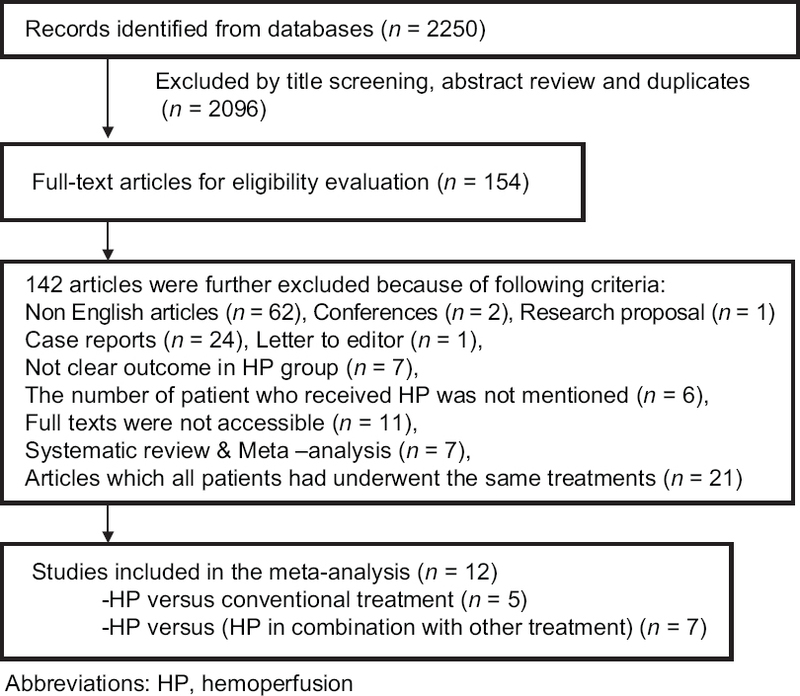 We performed a meta-analysis to see whether hemoperfusion (HP) in combination with other treatments reduces the mortality more than HP alone in patients with PQ poisoning. Materials and Methods: We searched EMBASE, PubMed, Google Scholar, ISI Web of Knowledge, Cochrane Central Register of Controlled Trials, Scopus, Springer, TRIP, ProQuest, and references of the included studies from January 2000 to August 2017. Two reviewers independently searched and extracted data. We measured I2 to determine variance contributed by heterogeneity. To investigate the publication bias, Begg's and Egger's tests were used along with funnel plot analysis. 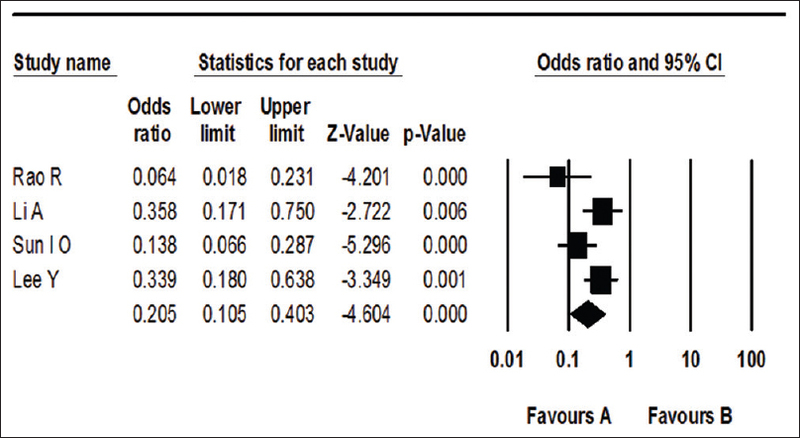 Results: Ultimately 12 articles were included in the meta-analysis. Five articles compared HP with conventional therapy with a total of 1311 patients, and seven articles compared mortality of patients received HP versus those received HP in combination with an additional treatment. HP alone reduced the odds of death (odds ratio [OR] = 0.20; 95% confidence interval [CI]: 0.11–0.40, P < 0.0001) compared to conventional therapy. Furthermore, the odds of death was higher in HP group compared to those received HP in combination of additional treatments (OR = 1.24; 95% CI: 1.05–1.46, P= 0.01). Conclusion: The mortality was less in HP-treated group compared to those received only conventional therapy. Addition of other treatments with HP reduced the mortality more than HP alone. Until now, there are five meta-analyses about treatment of PQ poisoning.,,,, Agarwal et al., Li et al., and He et al. reported meta-analysis about the effect of pulse immunosuppressive and glucocorticoid therapy, which showed a beneficial effect.,, CVVH prolonged the survival time of the patients without significant effect on mortality. Li et al. reported a meta-analysis about the reducing effect of HP on mortality. However, many studies did not show the beneficial effects.,,,,,,,,,,,,,, Although the efficacy of pulse immunosuppressive glucocorticoid therapy, CVVH, and HP alone has been shown in above-mentioned meta-analyses, the mortality is still high in single treatment. Since PQ poisoning is a serious public health problem in many countries, we performed a meta-analyses study to see whether HP in combination with other treatments reduces the mortality of PQ poisoning more than HP alone as no reported study yet. The project was approved by the Institutional Ethics Committee of our university. We searched Google Scholar, EMBASE, Pub Med, ISI Web of Knowledge, Cochrane, Scopus, Springer, TRIP, and ProQuest from January 2000 to August 2017. The search strategies included (paraquat) AND (poisoning OR intoxication OR toxicity OR overdose) AND (hemoperfusion OR charcoal hemoperfusion) AND (survival OR death OR mortality OR fatality) in title and abstract based on MESH/subject. The list of references for the studies identified was also examined for more relevant studies. Inclusion criteria were studies: (1) published articles from January 2000 to August 2017, (2) research was performed on patients (both adults and children) with PQ poisoning, (3) all patients or some of them underwent charcoal HP, (4) outcomes of treatment as death or survival had been reported, and (5) the full text of the published papers was available in English. Exclusion criteria of this study were as follows: (1) case reports and review articles and (2) studies that all patients received the same treatment. With the use of approved keywords in Mesh, the titles of articles were searched. Then, abstracts in English were extracted. Screening process was carried out by two investigators independently who were blinded to the objective of the study. The disagreements between two researchers resolved through the involvement of a third researcher in the discussion meeting by considering the reasons for study inclusion and exclusion criteria. Finally, full texts of articles were selected. In the absence of available full text, the article was requested through an E-mail from the authors, research gate, or by librarians in the Isfahan University of Medical Sciences. Information about the publication such as name of the first author, year of publication, country of study, type of study, age, PQ concentration, sodium dithionite test, time from ingestion to admission, time to performing HP, HP duration and times, mortality, and follow-up were recorded in the tables. All patients in the evaluated studies had received some of the following conventional therapy including gastric lavage, activated charcoal, fuller earth, diuretic, dexamethasone, Vitamin C, Vitamin E, NAC, other antioxidants, sodium bicarbonate, glutathione, hormones, cathartics, HD for a patient with acute renal failure if necessary, and other supportive care. However, with respect to using HP alone or in combination with other treatments, we categorized and analyzed our studies based on following two sets. This set considers those articles compared mortality between two groups of patients; patients received HP and those not received HP. Both groups had also received conventional therapy as mentioned in the method section. This set includes those articles compared the mortality between two groups of patients. 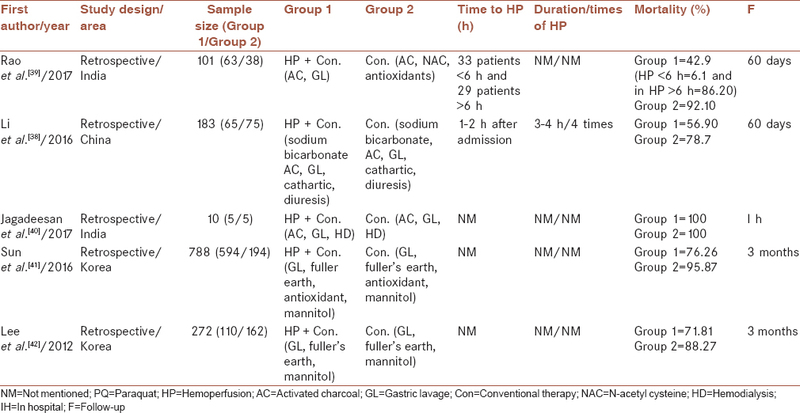 Patients in control group received HP, and patients in study group received HP in combination with other treatments. Both groups had also received conventional therapy as mentioned in methods section. The results analyzed using the comprehensive meta-analysis software version 2.0 (Biostat, Englewood, NJ, USA). Cochrane test (Q) of heterogeneity was carried out among the studies. For determining the existence of heterogeneity among studies, the significance level was considered as <0.05. Odds ratios (ORs) or relative risk (RR) with 95% confidence intervals (CIs) using forest plot and with the fixed and random effect approach has been analyzed. Heterogeneity was measured by calculating I2. Substantial heterogeneity was indicated if P < 0.05 and I2 > 50% when a random-effects model should be selected. If homogeneity was suggested (P > 0.05 and I2 < 50%), a fixed-effects model was used. The main outcome was mortality. 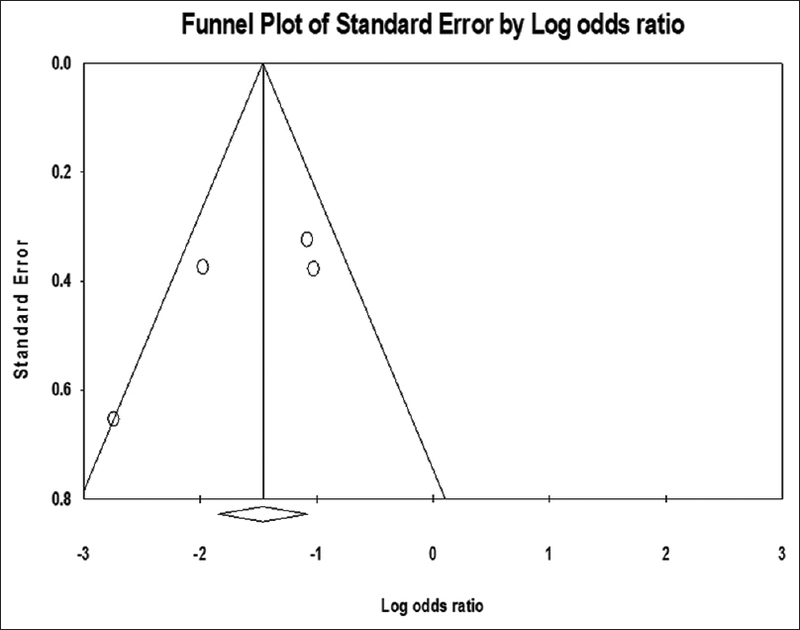 To investigate the publication bias, Begg's and Egger's tests were used along with funnel plot as a graphical test. 95% CI was estimated and included in forest plot. An initial search identified 2250 records from databases. Considering exclusion criteria, 154 articles had eligibility for full-text evaluation. One hundred and forty-two full-text articles were further excluded, and ultimately 12 articles were selected for meta-analysis including 8 retrospective, 3 RCT, and 1 case–control studies. A flow diagram that detailed the process is presented in [Figure 1]. Quality assessment of articles showed that CASP score of all 12 articles was higher than 65 which were acceptable. The studies included in this set are summarized in [Table 1] and [Supplementary Table 1]. We found 5 articles with a total of 1311 patients.,,,, Eight hundred and thirty-seven patients were underwent HP, of which 592 patients died (70.72%). Four hundred and seventy-four patients did not receive HP, of which 428 patients died (90.29%). In a study of Li et al., because of evaluation of three groups of patients, data of one group were included in this set analysis (HP vs. non-HP) and data of other groups were included in the data set of HP versus (HP + other treatments) which will be explained in the next section. The mortality rate in one study was the same (100%) in both HP and non-HP groups; therefore, it did not presented by the software in the funnel and forest plot. 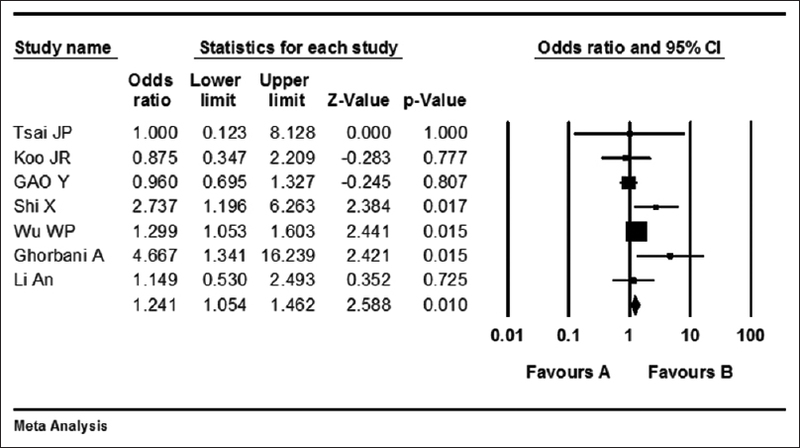 The funnel plot showed no publication bias in the studies [Figure 2]. The meta-analysis of this group showed that I2 was 32.87 (q = 4.46, P= 0.2) indicating no significant heterogeneity. Using the fixed effect, the OR was 0.20 (95% CI = 0.11–0.40) with z = 4.604 (P < 0.0001), which showed that the mortality was less in patients received HP compared to those received only conventional treatment [Figure 3]. 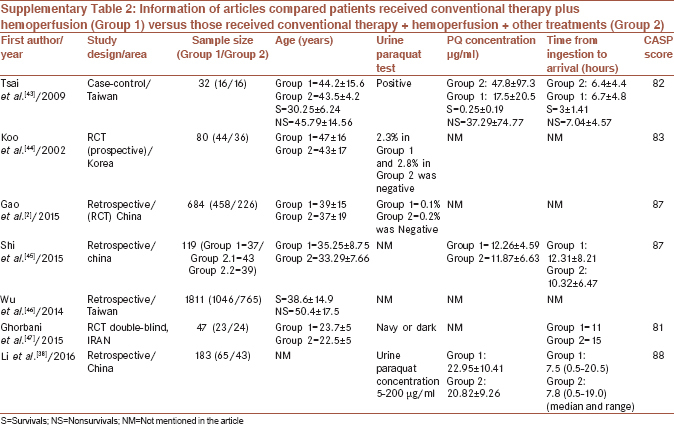 Seven articles included in this set which their results are summarized in [Table 2] and [supplementary Table 2].,,,,,, Patients in HP group received conventional therapy and HP. 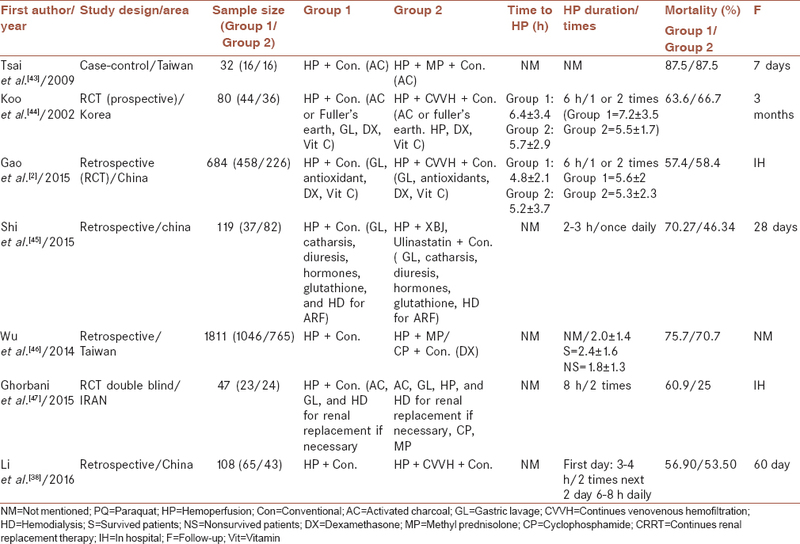 Patients in HP in combination with other treatment group received conventional therapy, HP, and CVVH or continuous renal replacement therapy (CRRT) or CP or/and MP or Chinese medications Xuebijing (XBJ)/Ulinastatin. Analysis of these seven articles evaluated 2881 patients. About 1689 cases were in HP group, and from them, 1174 died (69.50%), and 1192 patients were treated with HP in combination with other treatments, of which 777 died (65.18%). Begg's tests showed no asymmetry among studies (Kendall's S statistic: 13, P= 0.07) indicating no publication bias. The meta-analysis showed that I2 was 45 (Q = 11, P= 0.1) showing no heterogeneity, so using fixed effect model, OR was 1.24 (95% CI = 1.05–1.46 and z = 2.58; P= 0.01) which showed that mortality was higher in HP group compared to HP + other treatments [Figure 4]. Our meta-analysis results showed that mortality was less in patients underwent HP besides conventional therapy compared with those only received conventional treatment (OR: 0.20; 95% CI: 0.10–0.40). Our result is similar to previous meta-analysis. In Li et al. study, HP also reduced mortality significantly (RR: 0.60; 95% CI: 0.54–0.66) and the mortality rate was 38.4% in HP-treated patients which is lower than our analysis. Limited resources of their study which included PubMed, Web of Science and one Chinese database (China National Knowledge Infrastructure), or publication bias may be the reason. Although HP reduced mortality, the mortality is still high which seems that other treatments for PQ poisoning should be considered. Our results showed patients received HP in combination with other treatments (MP/CP/CVVH/CRRT or XBJ and Ulinastatin) had less mortality compared to those received only HP. With respect to heterogeneity in this result, I2 was 45 showing no heterogeneity. Two studies showed different results compared with other studies. The mortality of patients received HP was not significantly different from those received HP in combination with CVVH., With respect to mortality, in three studies, CVVH was the additional treatment besides HP, without any significant effect on mortality compared to those received only HP.,, CVVH increased the time to death in the patients. Recent meta-analysis about evaluation of the efficacy of CVVH in the treatment of PQ poisoning supports this issue. Patients received HP in combination with other treatments (MP/CP/XBJ/Ulinastatin, XBJ) had better prognosis than those received HP alone. When the other treatments are not available, the HP alone also can reduce mortality compared to conventional therapy. As the mortality is still high, an education on harmful effects of PQ ingestion for the population is necessary to reduce the PQ poisoning. The other potential heterogeneity sources such as time to performing HP and duration of HP therapy (short or long courses) had not been determined in all articles. Due to lack of sufficient data, we could not analyze the outcome with respect to these which can be another limitation of our study. We may suggest performing future RCT studies considering the severity of poisoning based on blood PQ level to be able determine whether HP alone or HP with other intervention or medications reduces the mortality. The authors would like to thank the staffs of Khorshid Hospital Library for their great cooperation. This work was supported by Isfahan University of Medical Sciences (grant number: 395012). Eddleston M, Wilks MF, Buckley NA. Prospects for treatment of paraquat-induced lung fibrosis with immunosuppressive drugs and the need for better prediction of outcome: A systematic review. QJM 2003;96:809-24. Gao Y, Zhang X, Yang Y, Li W. Early haemoperfusion with continuous venovenous haemofiltration improves survival of acute paraquat-poisoned patients. J Int Med Res 2015;43:26-32. Kang MS, Gil HW, Yang JO, Lee EY, Hong SY. Comparison between kidney and hemoperfusion for paraquat elimination. J Korean Med Sci 2009;24 (Suppl l):S156-60. Bismuth C, Garnier R, Baud FJ, Muszynski J, Keyes C. Paraquat poisoning. An overview of the current status. Drug Saf 1990;5:243-51. Lee CJ, Hsu HW, Chang YL. Performance characteristics of combined haemodialysis/haemoperfusion system for removal of blood toxins. Med Eng Phys 1997;19:658-67. Shi Y, Bai Y, Zou Y, Cai B, Liu F, Fu P, et al. The value of plasma paraquat concentration in predicting therapeutic effects of haemoperfusion in patients with acute paraquat poisoning. PLoS One 2012;7:e40911. Zhou DC, Zhang H, Luo ZM, Zhu QX, Zhou CF. Prognostic value of hematological parameters in patients with paraquat poisoning. Sci Rep 2016;6:36235. Wang HR, Pan J, Shang AD, Lu YQ. Time-dependent haemoperfusion after acute paraquat poisoning. Sci Rep 2017;7:2239. Park S, Lee S, Park S, Gil H, Lee E, Yang J, et al. Concurrent hemoperfusion and hemodialysis in patients with acute pesticide intoxication. Blood Purif 2016;42:329-36. Yeo CD, Kim JW, Kim YO, Yoon SA, Kim KH, Kim YS, et al. The role of pentraxin-3 as a prognostic biomarker in paraquat poisoning. Toxicol Lett 2012;212:157-60. Wang Y, Chen Y, Mao L, Zhao G, Hong G, Li M, et al. Effects of hemoperfusion and continuous renal replacement therapy on patient survival following paraquat poisoning. PLoS One 2017;12:e0181207. Lin JL, Lin-Tan DT, Chen KH, Huang WH, Hsu CW, Hsu HH, et al. Improved survival in severe paraquat poisoning with repeated pulse therapy of cyclophosphamide and steroids. Intensive Care Med 2011;37:1006-13. Weng CH, Chen HH, Hu CC, Huang WH, Hsu CW, Fu JF, et al. Predictors of acute kidney injury after paraquat intoxication. Oncotarget 2017;8:51345-54. Li Y, Wang M, Gao Y, Yang W, Xu Q, Eddleston M, et al. Abnormal pancreatic enzymes and their prognostic role after acute paraquat poisoning. Sci Rep 2015;5:17299. Agarwal R, Srinivas R, Aggarwal AN, Gupta D. Immunosuppressive therapy in lung injury due to paraquat poisoning: A meta-analysis. Singapore Med J 2007;48:1000-5. Li LR, Sydenham E, Chaudhary B, You C. Glucocorticoid with cyclophosphamide for paraquat-induced lung fibrosis. Cochrane Database Syst Rev 2010:CD008084. Li H, Song L, Jain X. Efficacy of haemoperfusion therapy in patients with paraquat poisoning: A meta-analysis. Int J Clin Exp Med 2017;10:11371-81. He F, Xu P, Zhang J, Zhang Q, Gu S, Liu Y, et al. Efficacy and safety of pulse immunosuppressive therapy with glucocorticoid and cyclophosphamide in patients with paraquat poisoning: A meta-analysis. Int Immunopharmacol 2015;27:1-7. Lin G, Long J, Luo Y, Wang Y, Zewu Q. Continuous venovenous hemofiltration in the management of paraquat poisoning: A meta-analysis of randomized controlled trials. Medicine (Baltimore) 2017;96:e6875. Eizadi Mood N, Sabzghabaee AM, Ghodousi A, Yaraghi A, Mousavi A, Massoum G, et al. Histo-pathological findings and their relationship with age, gender and toxin amounts in paraquat intoxication. Pak J Med Sci 2013;29:403-8. Eizadi-Mood N, Sabzghabaee AM, Badri S. Paraquat poisoning: What the acute care physician needs to know? Review article. JIMS 2011;29:997-1006. Eizadi-Mood N, Sabzghabaee AM, Yaraghi A, Montazeri K, Golabi M, Sharifian A, et al. Effect of antioxidants on the outcome of therapy in paraquat intoxicated patients.TJPR 2011;10:27-31. Sabzghabaee AM, Eizadi-Mood N, Montazeri K, Yaraghi A, Golabi M. Fatality in paraquat poisoning. Singapore Med J 2010;51:496-500. Maasoumi G, Eizadi-Mood N, Akabri M, Sohrabi A, Khalili Y. Pattern of poisoning in poisoning referral center. JIMS 2012;29:1317-24. Masoumi G, Ganjei Z, Teymoori E, Akabri M, Eizadi-Mood N. Evaluating the prevalence of intentional and unintentional poisoning in vulnerable patients admitted to a referral hospital. JIMS 2013;31:1452-60. Zhang Q, Wu WZ, Lu YQ, Wang JZ, Shang AD, Yao F, et al. Successful treatment of patients with paraquat intoxication: Three case reports and review of the literature. J Zhejiang Univ Sci B 2012;13:413-8. Hsu CW, Lin JL, Lin-Tan DT, Chen KH, Yen TH, Wu MS, et al. Early hemoperfusion may improve survival of severely paraquat-poisoned patients. PLoS One 2012;7:e48397. Kang X, Hu DY, Li CB, Li XH, Fan SL, Liu Y, et al. The volume ratio of ground glass opacity in early lung CT predicts mortality in acute paraquat poisoning. PLoS One 2015;10:e0121691. Chao LK, Fang TC. Dialysis catheter-related pulmonary embolism in a patient with paraquat intoxication. Ci Ji Yi Xue Za Zhi 2016;28:166-9. Gil HW, Hong JR, Jang SH, Hong SY. Diagnostic and therapeutic approach for acute paraquat intoxication. J Korean Med Sci 2014;29:1441-9. Hsieh YW, Lin JL, Lee SY, Weng CH, Yang HY, Liu SH, et al. Paraquat poisoning in pediatric patients. Pediatr Emerg Care 2013;29:487-91. Tsai TY, Weng CH, Lin JL, Yen TH. Suicide victim of paraquat poisoning make suitable corneal donor. Hum Exp Toxicol 2011;30:71-3. Chen HW, Tseng TK, Ding LW. Intravenous paraquat poisoning. J Chin Med Assoc 2009;72:547-50. Critical Appraisal Skills Program. CASP (Randomized Controlled Trial) Checklist; 2018. Critical Appraisal Skills Program. CASP (Case Control Study) Checklist; 2018. Critical Appraisal Skills Program. CASP (Cohort Study) Checklist; 2018. Li A, Li W, Hao F, Wang H. Early stage blood purification for paraquat poisoning: A multicenter retrospective study. Blood Purif 2016;42:93-9. Rao RR, Bhat R, Pathadka S, ChenjI SK, Dsouza S. Golden hours in severe paraquat poisoning-the role of early haemoperfusion therapy. J Clin Diagn Res 2017;11:OC06-8. Jagadeesan M, Nithyananthan P, Banupriya M, Mahendrakumar K, Prasanna KS, Kannan R. A study on clinical profile of paraquat poisoning in a tertiary care hospital. Int J Adv Med 2017;4:1088-91. Sun IO, Shin SH, Yoon HJ, Lee KY. Predicting the probability of survival in acute paraquat poisoning. Kidney Res Clin Pract 2016;35:102-6. Lee Y, Lee JH, Seong AJ, Hong CK, Lee HJ, Shin DH, et al. Arterial lactate as a predictor of mortality in emergency department patients with paraquat intoxication. Clin Toxicol (Phila) 2012;50:52-6. Tsai JP, Lee RP, Wang CH, Fang TC, Hsu BG. Clinical study of prognosis and glucocorticoid pulse treatment in patients with acute paraquat intoxication. Tzu Chin Med J 2009;21:156-60. Koo JR, Kim JC, Yoon JW, Kim GH, Jeon RW, Kim HJ, et al. Failure of continuous venovenous hemofiltration to prevent death in paraquat poisoning. Am J Kidney Dis 2002;39:55-9. Shi X, Zhang Y, Wang Y. Impact of xuebijing and ulinastatin as assistance for hemoperfusion in treating acute paraquat poisoning. Int J Clin Exp Med 2015;8:14018-23. Wu WP, Lai MN, Lin CH, Li YF, Lin CY, Wu MJ, et al. Addition of immunosuppressive treatment to hemoperfusion is associated with improved survival after paraquat poisoning: A nationwide study. PLoS One 2014;9:e87568. Ghorbani A, Masoumi K, Forouzan A, Rahmani AH, Rahim F, Taherinezhad TB, et al. Effect of pulse therapy with glucocorticoids and cyclophosphamide in patients with paraquat poisoning. Hong Kong J Emerg Med 2015;22:235-340. Gong P, Lu Z, Xing J, Wang N, Zhang Y. Traditional Chinese medicine xuebijing treatment is associated with decreased mortality risk of patients with moderate paraquat poisoning. PLoS One 2015;10:e0123504. Zheng X, Sun X, Ma P, Liu Z, Jiang N. Therapeutic potential of intravenous xuebijing on transforming growth factor beta1 and procollagen type III peptide in patients with acute paraquat poisoning. J Tradit Chin Med 2012;32:584-9.